We had been reading about embedded tweets since some days. Finally twitter has enabled the embedding feature which will allow us to add tweets to our blogs very easily. Earlier if we wanted to display any tweet on blog, we had to take a screen shot of the tweet and then put it on our blog. But now we just have to copy the tweet URL . The tweet URL is the URL of the time that is shown just below the tweet. Once you have copied the URL, visit Blackbird pie and paste the URL and click on Bake it and the code for the embedded tweet will be generated. Just copy the code and paste it on your blog. Here is an example of embedded tweet. The background of the embedded tweet will be that of your twitter profile background. There are some issues with the final result but it will get sorted out soon. 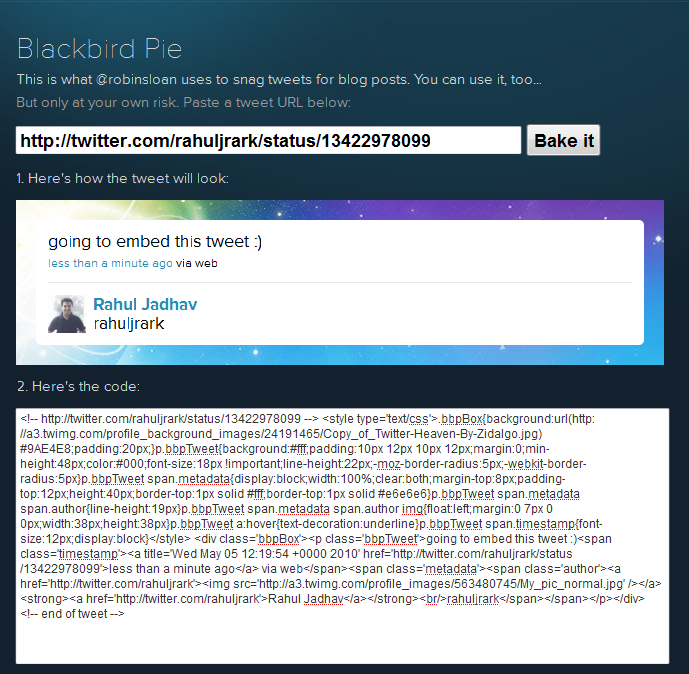 Still its a great way to show tweets on blogs.